When Hollywood calls to offer New York novelist Stine the opportunity to adapt his books into a film for the big screen, he packs up and moves to the home of sunsets, palm trees and stars. The story switches between the world of Hollywood and Stine’s in-progress script. While Stine’s movie plays out in black and white, Stine finds the enticements of Los Angeles—women, nightlife and the artistic negotiations to his script—a little much. City of Angels is a combination of classic film noir, drama and comedy all rolled into one musical experience. Not only does City of Angels create a classic film noir style set in the late 1940s, it also focuses on two different worlds: Stine’s reality behind the typewriter and his creation shown in black and white. Two stories play out on the stage, one fiction and one real, while the whole story is enhanced with glamourous 1940s jazz music that perfectly fits the overall ambiance of the show. Its gritty, sometimes cynical characters and the thin line between fiction and reality are combined with moments of comedy that really make City of Angels a unique performance. 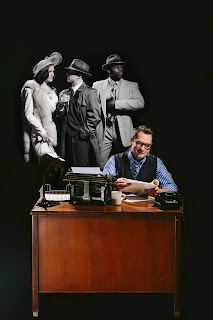 City of Angels is on the Hawks Mainstage at the Omaha Community Playhouse March 4 – April 3, 2016. Single tickets are $40 for adults and $25 for students. For tickets, visit the OCP Box Office at 69th and Cass Street, call 402-553-0800 or click here. Caroline Thibodeaux is an African American maid for a white Jewish family, the Gellmans, spending her days in their basement doing the laundry for a small sum of $30 a week. The Gellmans' son, Noah, has a strong bond with Caroline who consoles him in the death of his mother. Noah's new stepmother Rose, unable to give Caroline a raise, decides to teach Noah a lesson in the value of money. Noah has a habit of leaving change his pants pocket. Rose tells Noah and Caroline that Caroline should keep the money that Noah leaves in his pockets. Caroline is not fond of the idea but lacks money for her own children. The lesson goes amiss when the ownership of a $20 bill is contested after it is found in the laundry, and Caroline's relationship with eight-year-old Noah is irreversibly shattered. Change is not only prevalent in the form of money in Caroline’s life but in the sweep of historical change worldwide. Not only is the play set on November 23rd 1963, the day after the assassination of President John F. Kennedy, but also many other historic events take place around this era in the middle of the civil rights movement. The federal government enforces school integration, and a majority of white students boycott the rest of the term. Police disperse 1,500 civil rights protestors with attack dogs and tear gas. According to the Justice Department, in the 10 weeks before King's "I Have a Dream" speech, there were 758 demonstrations in 186 cities resulting in 14,733 arrests. • 1963 is considered the defining year in the civil rights movement. Some 2,000 people, including both black and Jewish protesters, set out from Selma on March 21, protected by U.S. Army troops and Alabama National Guard that President Johnson had ordered. After walking nearly 12 hours a day and sleeping in fields along the way, they arrived in Montgomery on March 25, where nearly 50,000 civil rights supporters were waiting. Caroline, or Change depicts the gripping feel of the civil rights movement through the eyes of a maid attempting to deal with the events unfolding around her, both in her personal life as well as in the world around her.